As soon as I knew Blue was going to be a big dog, I knew he was going to be a blood donor. Blue is an excellent donor. I'm so proud of him, as it is another incredible feat for him to be a reactive dog, yet so willing to donate blood. You can read about Blue's troubled childhood and his reactivity here. Dogs sometimes need blood transfusions just like people. They get diseases which destroy their red blood cells, or they can have clotting problems, or they can lose a lot of blood from trauma like getting hit by a car. Because of this, veterinarians often need blood transfusions in a hurry and a blood bank is the best way to make sure there is always blood available when it's needed. 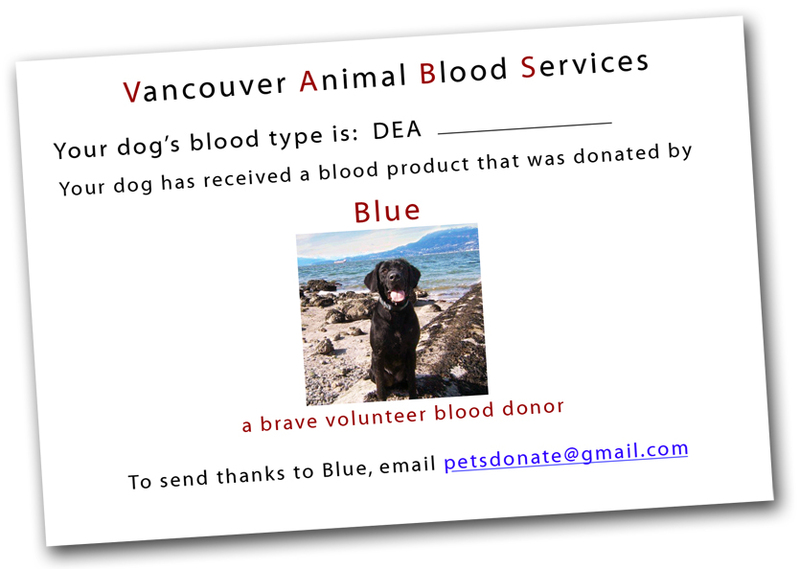 Luckily for Vancouver area dogs, Vancouver has its own doggy blood bank, Vancouver Animal Blood Services or VABS. Dogs have blood types, just like people, and they also have a Universal Donor blood type, just like people. When we tested Blue, I was very excited to learn that he has the universal blood type, as that meant he could donate to any other dog. He is such a big dog, I knew that he would have lots of blood to give and that he could save a lot of lives. Dogs need to be at least a year old before they can donate so I had a lot of time to teach Blue about the things he would need to do. We made games out of pretending that he was donating, like asking him to give a paw and to lie down and stretch his neck out. Each time he played the game of donation, he got the best treats (canned food and steak are his favourites!) and lots and lots of praise from myself and all his friends at VABS. When he was a baby, we started with doing a few things for just a few minutes at a time. As he got older and more confident, we gradually added more of the things he would need to do and for longer times. Because of the heavenly treats and praise, Blue very quickly decided this was a very fun and exciting thing to do, and he looked forward to the game of donation. By the time he was old enough for a real donation, he was a pro at the whole thing. He even started training us as to how he thought it should be done! Blue donates approximately every 3 months. When its time, Dr. Klassen calls to set up a donation appointment around his agility schedule. They are very accommodating at VABS! After taking a history from me to ensure he has been healthy, he is given a little sedation to relax him. Its just enough to make him a little less bouncy and makes him very happy. After the sedation has had a chance to work, Blue comes into the donation room, jumps up onto the table and lies down on his side - all by himself. In this relaxed position, he gets a full physical examination from Dr. Klassen. A small blood sample is taken from his leg to make sure his red blood cell count is normal. Most dogs would have this done before getting on the table but Blue wants to get on the table as fast as possible, so we let him. This is one of the ways he has trained us and is probably because when he was a puppy, the most delicious treats came when he was on the table. We put a bandana over his eyes to shut out the bright lights and this relaxes him even further. Once he passes the examination and the blood sample is read as normal, the veterinary technician shaves a little bit of hair over his jugular vein (which is where the needle will go). She thoroughly cleans his skin, tests the equipment one last time, and then puts the needle into his jugular vein. It's a big needle, the same size as used in human donations. Sometimes Blue flinches a little as the needle goes into the skin but often he doesn't seem to feel it at all. When the needle is in his vein, the blood starts flowing into the collection bags. The donation team uses a vacuum pump which pulls the blood into the collection bags faster than it would flow out by gravity. 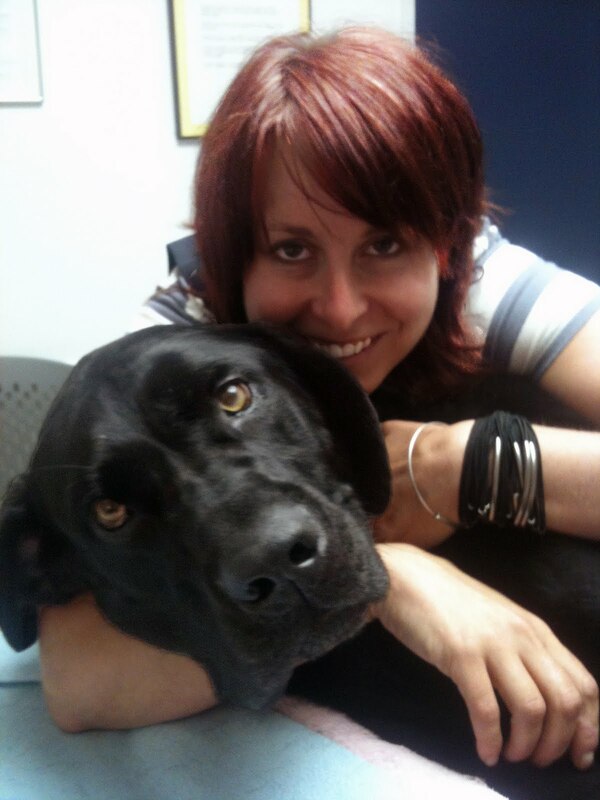 Blue is a big dog so his blood flows quickly and he reaches his donation amount of 450 mls in just a few minutes. 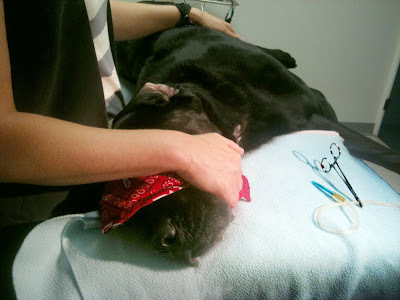 The VABS team take the needle out and hold a sterile pressure bandage over his jugular for about 10 minutes. Once they are sure that the bleeding has stopped, the pressure bandage is removed. They gently wash off the cleaning soap, in case it might irritate his skin, and put a bit of ointment on the shaved area, again, just in case his skin might be mildly irritated. After that, Blue sits up and is given the motherload of all treats, a whole can of food. He inhales this in about 30 seconds flat and then looks around hopefully for more. We help him off the table and then he strolls to his bed and relaxes until its time to go home. Its all over and done with in under an hour. You would think that donating a whole unit of blood would slow him down for a few days, but often I don't notice one iota of difference. It may be because he is such a big dog (have I said that before? ), or perhaps its because he knows how to pace himself. His sister, The Insane Dog, is smaller and she doesn't know the meaning of pacing. She also donates, and the next day it's almost comical when she starts off zooming around like she always does, and then an expression of something like confusion comes over her as she realizes she is a wee bit more tired than usual. At the time that I write this, Blue has just donated for the 12th time. That's 48 bags of blood and plasma that have gone to other dogs in need. He will be able to donate for a couple more years but the blood bank is always in need of more donors like Blue and The Insane Dog. If you have a lovely, calm, young, medium to large sized dog, your dog may also be able to be a blood donor. 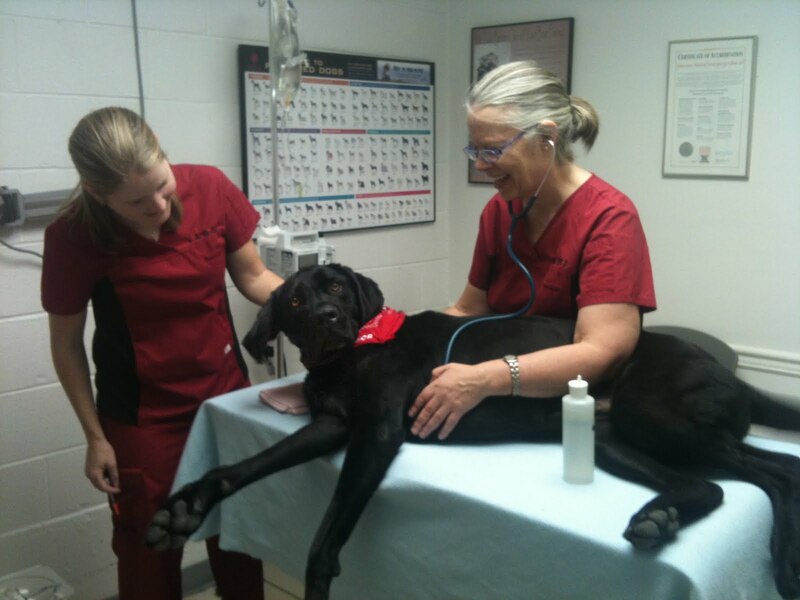 Contact your family veterinarian to ask about blood donation programs in your area. 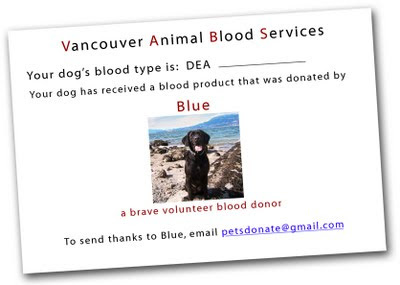 If you are from the Vancouver area you can visit the Vancouver Animal Blood Services website at http://www.animaler.com/blood-donor-program to see if your dog fits the requirements to be a donor. Maybe your dog will be a blood donor hero too. yay blue! both of his bags of prbcs are already off helping other dogs!